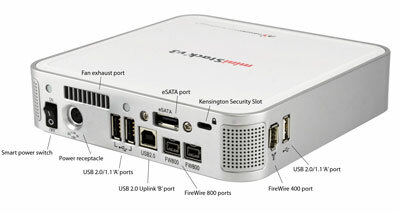 Are you looking to add external ports and more storage to your home office set-up? Then look no further than Newer Technologies miniStack v3. This unit works very well with a Mac mini, but other Mac users will also find this unit a worthwhile addition. 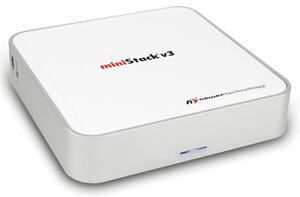 The miniStack v3 measures 6.5” square x 1.5” tall. It has a ring around the top that allows the mini to sit right on top. With no logos, except on the top, the clean, brushed aluminum band around the unit, which matches the Mac mini, is all that you see. I think a Mac mini would look nice perched on top. The only thing visible on the front is a blue LED that flashes as the drive is being written to/from. Inside the miniStack v3 you’ll find a 16MB data cache, plus an intelligent thermal sensor that only activates the fan when needed to reduce power consumption and minimize noise. Speaking of noise, I find this unit to be very quiet. Inside the unit you find it has the latest generation Oxford 924 chip-set for very fast file transfers. These units will even power off/on when you shut your computer down or start it up. When you shut down, you can hear the drive park itself, and then it goes quiet. The blue light in the front stays on. When you start your Mac up again, the drive fires up and mounts. The bottom of the unit has a large set of non-skid feet. Two USB 2.0/1.1 ports, a USB 2 uplink “B” port, two Firewire 800 ports, and one eSATA port. Also on the back are the power switch, and a Kensington security slot so you can lock the unit down. On the left side of the unit you’ll also find two handy ports for quickly connecting external devices, one USB 2.0/1.1 port and a Firewire 400 port. The miniStack v3 comes with a software disk containing the following software for the Mac: Prosoft Data Backup 3 ($59 value) and Intech SpeedTools ($89.95 value). Already on the drive is a folder called the OWC Shareware Collection. This includes drive icons (except a miniStack drive icon), shareware and freeware, Apple commercials, and some updaters for Systems 9 and X. You get a power cord and transformer as well as three cables: 36” Firewire 800 cable, 36” USB 2.0 A-B cable, and a 12” Firewire 800 to 400 cable. There is no eSATA cable included. How does the drive perform? As you can see above, using the FW cables produced the fastest copy operation. I’d say those speeds were pretty quick. How does the miniStack v3 differ from the miniStack v2? This new version of the miniStack is different in many ways. The v3 uses the faster Oxford 924 Bridge Chipset for reading/writing. The internal drive is SATA while the v2 was PATA (IDE/ATA). These two upgrades alone speeded up the drives. The inclusion of two FW 800 ports and an eSATA port pushed up transfer rates from 50 MB/s for the FW 400 ports (the fastest port on the v2 drive) to 100 MB/s and 150 MB/s respectively. You can buy these drives in a zero configuration, add your own hard drive, or buy a pre-configured drive in sizes from 160GB to 1.0TB. This is a very nice product, especially if you have a Mac mini. If you don’t, this is still a very functional unit that really acts as a hub, with all of the ports you can access. You can easily stack something else on top, like another miniStack. The entire unit feels very sturdy and it sits on your desk without shuffling around. I like the two side ports, which are very handy. I did not like the 12” FW800/400 cable or the lack of an eSATA cable. I also like the power down feature. I hate shutting things off. I think you’ll be very happy with the miniStack’s performance, flexibility and appearance.